Three well-known personalities who have demonstrated exceptional qualities of being transformational leaders by putting their passion and energy into everything and creating significant impact in the process are the awardees of the 2014 Outstanding Filipino (TOFIL) Award. 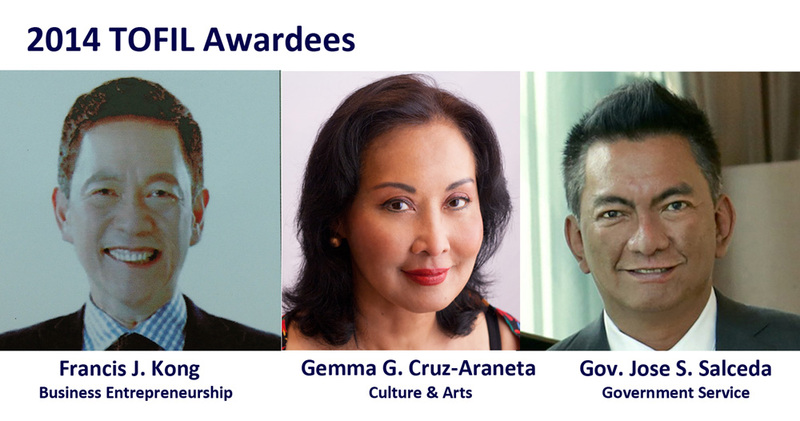 JCI Senate Philippines and The Insular Life Assurance Co., Ltd., the country’s leading Filipino-owned insurer, have named Gemma G. Cruz Araneta for Culture & Arts; Francis J. Kong for Business Entrepreneurship. ; and Jose Ma. Clemente S. Salceda for Government Service. They join the roster of more than 121 Filipinos who have been previously recognized as Outstanding Filipinos. Ms. Cruz Araneta, a celebrated writer, beauty queen, activist, and heritage conservationist, will be honored for her achievements in tirelessly promoting Philippine culture and the arts, awakening the national pride of generations of Filipinos, especially the young. Her half a century of work includes being a multi-awarded history writer and bestselling book author, journalist, a former Secretary of Tourism, and the first Filipina to win the Ms. International beauty pageant title. A descendant of Philippine national hero, Dr. Jose Rizal, and the daughter of acclaimed journalist Carmen Guerrero-Nakpil, Ms. Araneta is currently the chairperson of the Heritage Conservation Society, which advocates the conservation of the country’s heritage resources. Mr. Kong, meanwhile, is being awarded for many accomplishments as a businessman, columnist, broadcaster, book author, and motivational speaker. As an entrepreneur, he has brought to the Philippines the Canadian “Mad Science” franchise, an education-entertainment business that caters to kids. He also successfully runs his own business ventures that provide corporate coaching to top companies and organizations, inspiring Filipinos to perform better and be the best they can be. Mr. Salceda is being cited for his untiring work as a public servant for nearly 20 years. Aside from being the governor of Albay, he is also the chairman of the Bicol Regional Development Council and the brains behind the ALMASOR project, a tourism alliance among Albay, Masbate, Sorsogon, which has boosted tourist arrival to the Bicol provinces in less than a year after its inception in 2012. The three awardees will join a roster of 121 other Filipino men and women, 41 years and above, who have been recognized as Outstanding Filipinos (TOFIL) since the award started in 1988. The TOFIL awards night is scheduled on January 29, 2015 and will be held at the Tanghalang Haribon of the Insular Life Corporate Centre in Alabang, Muntinlupa.